We've been building enterprise click to chat applications for a long time. 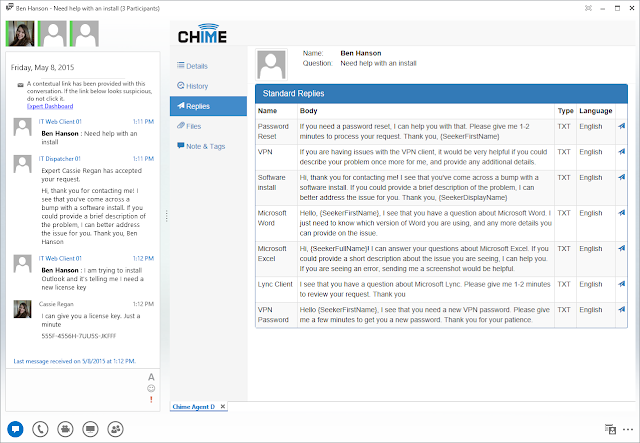 We have products that target Sametime (www.chimedesk.com), XMPP (www.addchimex.com) and Skype for Business (www.addchime.com). We are currently working on the next version of Chime for S4B and we are planning some nice enhancements to our click to chat web client. In the next release, we will provide a flexible web based chat client that is easy to customize, skin, and each service desk queue can optionally use a different web chat client. We are also including a form builder into the customization mix, so that customers can define pre-chat forms with a drag\drop form builder. We will also include some personal touches throughout the application, so that each service desk agent can provide a personal picture - and each queue can also add some personality with a personalized picture. If you are looking for click to chat solution for #S4B, then give Instant Chime for S4B a look. Recently, we released Instant IMtegrity 9.1 which continues to build on our outstanding IMtegrity platform. Instant IMtegrity 9.1 fully supports IBM Sametime 9.x and includes a host of features in addition to our core IM archiving module. Instant IMtegrity also includes a 30 minute installation process (try that with Actiance) and we've scaled to 50,000 users generating more than 1.5 million messages per month. We can handle customers from 500 to 50,000 seats. If you are considering #Sametime #compliance and #eDiscovery, then try the free evaluation of Instant IMtegrity. We offer free support during your evaluation and we know that you will be happy with the product and our exceptional service. For more than 10 years, we have been developing enterprise applications that take advantage of enterprise IM platforms. With our latest release of Instant Chime, we now fully support Skype for Business (S4B), Lync 2013, IBM Sametime, and XMPP. For our customers, extending the value of their S4B deployment across their service desk makes sense for both their employees and their service desk agents. Microsoft S4B provides presence, IM services, screen sharing capability, and excellent voice support - as a base platform, it is hard to beat. Instant Chime adds the ability to provide click to chat service desk escalation, the ability to create and manage service desk queues, reporting and metrics across all areas, and lots of other features critical to modern service desk. Several years ago, we developed an enterprise notification system that leverages Microsoft Lync 2010 to send IM based alerts to internal employees. Last year, we updated this application and rebranded the app as Instant Alert Manager (http://www.tryalertmanager.com/). Instant Alert Manager allows IT managers or folks within an enterprise to quickly and easily create and send employee based IM alerts using either Lync 2010 or Lync 2013. We are currently integrating Instant Alert Manager functionality into our enterprise service desk application. Before the end of the year, Instant Chime will incorporate much of the alerting capability - and it will include the ability to dispatch alerts using Microsoft Skype for Business (S4B). So, the next version of Instant Chime will include all our tools to enable next generation service desk operations - including the ability to pro-actively generate IM based alerts as part of an outage and/or notification system. 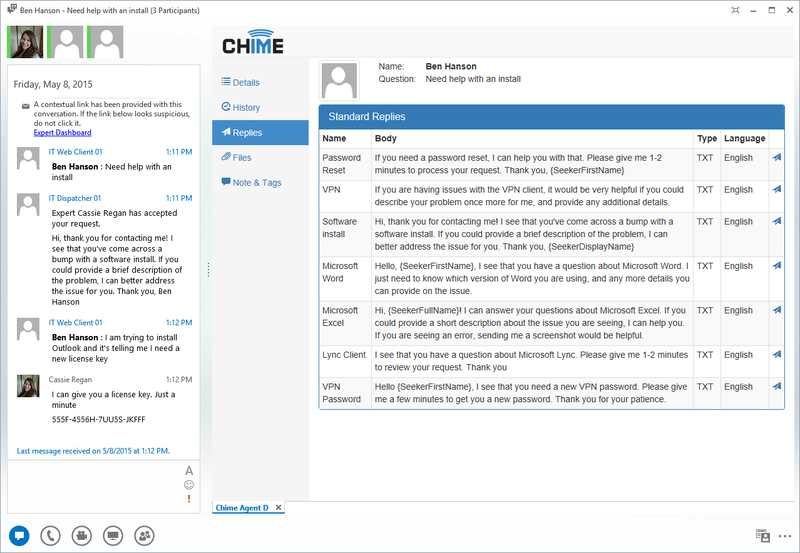 We've been busy building out an updated release of Instant Chime (www.addchime.com) that fully supports Skype for Business (aka S4B). Our latest release of Instant Chime includes the ability to use S4B as part of Office 365 or via the S4B on premise installation. 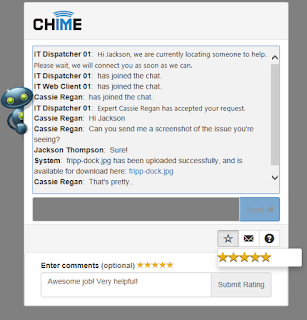 Instant Chime is a powerful addition to any enterprise service desk (#servicedesk) offering and provides click to chat functionality for both internal employees, and customers, to immediately connect with a service desk agent. Our customers are deploying Instant Chime in multiple languages, across different continents, and leveraging their S4B environment with great service desk functionality and our terrific user experience. ...and lots of other features. 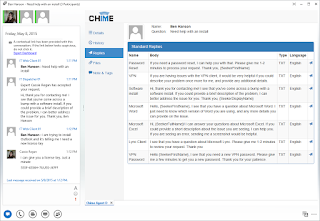 If you are looking to enhance your service desk with some powerful Skype 4 Business integration, then please give Instant Chime a look and then contact us for an evaluation.